April 23, 5:25 PM: BJP candidate from Pilibhit parliamentary constituency, Varun Gandhi visits a polling booth in Pilibhit and clicks selfies with supporters. April 23, 5:20 PM: Estimated voter turnout till now for the 3rd phase of the Lok Sabha Elections 2019 is 51.15%. Voting for 116 parliamentary constituencies across 13 states and 2 union territories is being held today. April 23, 4:20 PM: Senior Congress leader Ahmed Patel casts his vote at a polling station in Bharuch in Gujarat. April 23, 2:55 PM: Estimated voter turnout till now for the 3rd phase of the Lok Sabha Elections 2019 is 37.89%. Voting for 116 parliamentary constituencies across 13 states and 2 union territories is being held today. April 23, 2:10 PM: Voter Turnout till 1 PM: Jammu and Kashmir’s Anantnag recorded just 4.72%. While UP’s 10 Lok Sabha Seat is 10.24%. April 22, 05:18 PM: Union Minister Harsh Vardhan and AAP’s Pankaj Gupta file nominations from Chandni Chowk constituency in Delhi. Congress has named JP Aggarwal from Chandni Chowk Lok Sabha Seat. Delhi’s all 7 parliamentary seats will go to polls on May 12. April 22, 02:51 PM: BJP candidate Manoj Tiwari files nomination from North East Delhi. He is taking Congress Sheila Dixit and AAP’s Dilip Pandey. April 22, 2:15 PM: BJP candidate Pragya Singh Thakur files nomination from Bhopal Lok Sabha constituency. She is pitched against Congress Stalwart Digvijay Singh. April 20, 05:21 PM: Prime Minister Narendra Modi addressing a poll rally in UP’s East. April 20, 05:15 PM: S Krishna Kumar, former Congress MP from Kollam (Kerala), joins Bharatiya Janata Party in New Delhi. ‘My motive for rest of my life is to strengthen hands of PM Modi who I think the people of India should give a mandate not only for 5 years but for another 10 yrs. By this time, he’ll modernise the nation & take it to the forefront’ says former MP after joining BJP. April 19, 12:49 PM: Priyanka Chaturvedi will join Shiv Sena today says Shiv Sena Leader Sanjay Raut. She has quit the party after the party has reinstated Mathura leaders who had misbehaved with her. April 19, 11:18 AM: SP-BSP-RLD’s joint rally to begin shortly in Mainpuri; BSP Chief Mayawati and Mulayam Singh Yadav to share the stage. April 18, 04:10 PM: Voter turnout till 3 PM in Jammu and Kashmir is 38.5%, including 5.7% in Srinagar. While in West Bengal 65.43% recorded. Here is the breakdown according to seat wise: Jalpaiguri (SC) – 71.32%,Darjeeling – 63.14%, Raiganj – 61.84 %. State total – 65.43 %. April 18, 02:50 PM: Assam records 46.42 per cent polling till 1 pm. Here’s the breakdown according to seats: Karimganj: 46.87%, Silchar: 44.13%, Autonomous districts: 49.90%, Mangaldoi: 50.97% and Nowgong: 41.52%. April 18, 01:18 PM: A Bharatiya Janata Party delegation will meet the Election Commission at 4 pm over poll violence in West Bengal during second phase today. April 18, 12:19 PM: Union Minister Maneka Gandhi files her nomination from Sultanpur Lok Sabha constituency. April 18, 12:05 PM: Poonam Sinha of Shatrughan Sinha and SP-BSP-RLD candidate from the Parliamentary constituency of Lucknow files her nomination. She will be taking on Union Minister Rajnath Singh. April 18, 11:32 AM: Voter turnout till 11 AM in Bihar is 18.97%. Voter turnout till 11 AM in Uttar Pradesh (8 constituencies) is 24.31%. While 26.39% recorded in Assam, in Chhattisgarh is 26.2%. 30.62 per cent polling till 11 am in Tamil Nadu. While 17.8% recorded in Jammu and Kashmir. April 16, 05:10 PM: Election Commission (EC) issues a show-cause notice to Union Minister and BJP MP from Jodhpur, Gajendra Singh Shekhawat for violating Model Code of Conduct (MCC) by threatening public officials in his speech in Pokhran on 14 April. April 16, 04:55 PM: Samajwadi Party Leader Akhilesh Yadav to file nomination on April 18 for Azamgarh Lok Sabha Seat. April 16, 04:22 PM: BJP President Amit Shah holds a roadshow in Tumakuru, Karnataka. April 16, 11:31 AM: Union Minister Rajnath Singh holds Roadshow in Lucknow ahead of filing nominations. April 12, 05:45 PM: Congress President Rahul Gandhi addresses a rally in Theni, Tamil Nadu. Hailing his NYAY Scheme, Congress Chief said, This year, we have promised ‘justice’ or ‘NYAY’ to the people of India. If we come to power, we will not give money to the 15 richest businessmen as Mr. Modi does, we will not give Rs. 5 or Rs. 10; we will give Rs 72,000 annually to the 20% poorest families in India. April 12, 01:45 PM: Congress launches a scathing attack on BJP leader Smriti Irani over her educational qualification. Priyanka Chaturvedi of Congress said that she has misrepresented her educational qualification in earlier affidavits. April 11, 05:40 PM: Voter turnout till 3 pm in Andhra Pradesh was 55%, in Arunachal Pradesh was 50.87% and in Sikkim was 55%. April 11, 04:10 PM: Voter turnout till 3 pm in Uttar Pradesh is 50.86%. April 11, 01:45 PM: Chief Minister Yogi Adityanath and BJP Lok Sabha candidate from Amethi, Smriti Irani hold a roadshow in Amethi. Smriti Irani later in the day will file nominations for Amethi Lok Sabha Seat. She will take on Congress President Rahul Gandhi from Amethi Lok Sabha Polls 2019. April 11, 01:35 PM: Sonia Gandhi holds a roadshow ahead of filing nomination from Raebareli Lok Sabha Seat. April 11, 01:30 PM: 41.27% polling recording in Uttarakhand on all 5 seats till 1 pm. April 11, 10:25 AM: 18.12% voter turnout recorded till 9 am in West Bengal, 17.5% in Mizoram, 10.2% in Chhattisgarh and 15.6% in Manipur. While Voter turnout recorded till 9 am in Telangana is 10.6%, 5.83% in Andaman and Nicobar Islands, 10.2% in Assam and 13.3% in Arunachal Pradesh. April 11, 08:55 AM: Voting in all 91 Constituencies across 20 States and Union Territories underway. April 10, 12:55 PM: Congress President Rahul Gandhi files his nomination from Amethi for Lok Sabha Elections 2019. Sonia Gandhi, Priyanka Gandhi Vadra and Robert Vadra also present. April 10, 10:51 AM: Congress President Rahul Gandhi arrives in Amethi. He will file his nomination for #LokSabhaElections2019 from the Lok Sabha constituency today. April 09, 3:15 PM: Congress General Secretary Priyanka Gandhi holds Roadshow in support of party Candidate Imran Masood in UP’s West. Eight seats of UP West including Saharanpur will go to polls on April 11. Campaign for the first round will end today at 5 PM. April 08, 01:45 PM: Congress’s Priya Dutt filed her nomination from Mumbai North Central parliamentary constituency. April 08, 11:08 AM: Congress MP candidate from Mumbai North Urmila Matondkar to file nomination today. She said while speaking to ANI, ‘I am going to file my nomination today. I am feeling excited; The complaint filed against me is baseless and bogus. I believe in and respect Hinduism’. April 06, 2:18 PM: Dimple Yadav, Samajwadi Party’s candidate from Kannauj files nomination. Akhilesh Yadav, Ramgopal Yadav, Jaya Bachchan and BSP’s SC Mishra also present. April 06, 10:45 PM: BJP President Amit Shah holds a roadshow in Vejalpur area of Ahmedabad. April 05, 05:15 PM: Congress General Secretary for UP east Priyanka Gandhi Vadra and party’s candidate from the Parliamentary constituency Dolly Sharma hold a roadshow. April 05: 03:10 PM: A Congress delegation to meet the Election Commission of India today at 5:15 PM at Nirvachan Sadan. April 04: 04:45 PM: Hanuman Beniwal Rashtriya Loktantrik Party joins hands with BJP in Rajasthan for Lok Sabha Polls 2019. RLP has been offered Nagaur Lok Sabha Seat. April 04- April 12:50 PM: Nishad Party leader and Gorakhpur (UP) MP Praveen Nishad joins Bharatiya Janata Party. Nishad Party to support BJP in Uttar Pradesh in upcoming Lok Sabha elections. April 04: 11: 47 AM: Congress President Rahul Gandhi files nomination from Wayanad parliamentary constituency. April 04: 11:41 AM: Actor Rajpal Yadav arrives at Delhi Congress Chief Sheila Dikshit’s residence in Delhi. Yadav may be pitched against BJP Delhi Chief Manoj Tiwari. April 04, 11:28 AM: Congress President Rahul Gandhi and General Secretary UP-East Priyanka Gandhi Vadra arrive at Wayanad, Kerala. Congress President will file his nomination from Wayanad as the second seat. April 01, 03:23 PM: Facebook removes 687 pages, accounts linked to Congress party ahead of Lok Sabha Polls 2019. Facebook in a statement said, ‘We removed 687 Facebook Pages & the accounts-the majority of which had already been detected & suspended by our automated systems-that engaged in coordinated inauthentic behavior in India & were linked to individuals associated with an IT Cell of the Indian National Congress. April 01, 01:45 PM: Congress leader Shashi Tharoor files nomination from Thiruvananthapuram Parliamentary Constituency. April 01, 01:15 PM: Samajwadi Party Patriarch Mulayam Singh Yadav files Nominations from Mainpuri Parliamentary Seat. SP in Uttar Pradesh has forged an alliance with BSP and RLD. 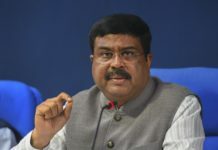 April 01, 12:26 PM: BJP releases another list of Candidates for Odisha. The saffron party named Abhimanyu Sethi from Badhrak Lok Sabha Seat. Sethi, son of Arjun Sethi, eighth time MP from Bhadrakh had on Saturday joined BJP after quitting BJD. April 01, 10:21 AM: Prime Minister Narendra Modi will be addressing three rallies today in three states. PM will address its first rally at 11.30 am in Wardha, Maharashtra. Later in the day, he is slated to address rallies in Deccan States. PM Modi at 02.45 pm is slated to address a poll rally at Rajahmundry in Andhra Pradesh, while in the evening he is slated to hold at Secunderabad, Telangana. April 01, 09:35 AM: Pragatisheel Samajwadi Party (Lohia) chief Shivpal Singh Yadav meets Mulayam Singh Yadav at his residence. Samajwadi Party Patriarch Mulayam Singh will file his nomination for Mainpuri Lok Sabha constituency today. March 30, 03:05 PM: Maratha leader Pravin Gaikwad joins Congress in the presence of Mallikarjun Kharge, Ashok Chavan and KC Venugopal. March 30, 02:00 PM: BJP President Amit Shah files his nomination for Gandhinagar parliamentary constituency. March 30, 1:00 PM: Aam Aadmi Party Chief Arvind Kejriwal on Friday again asserted to have a pre-poll alliance with Congress not in the national capital but in Haryana. Delhi Chief Minister said while talking to a TV Channel, ‘AAP is capable of defeating Bharatiya Janata Party on its own in the national capital, but the party needs Congress in Haryana to defeat BJP‘. 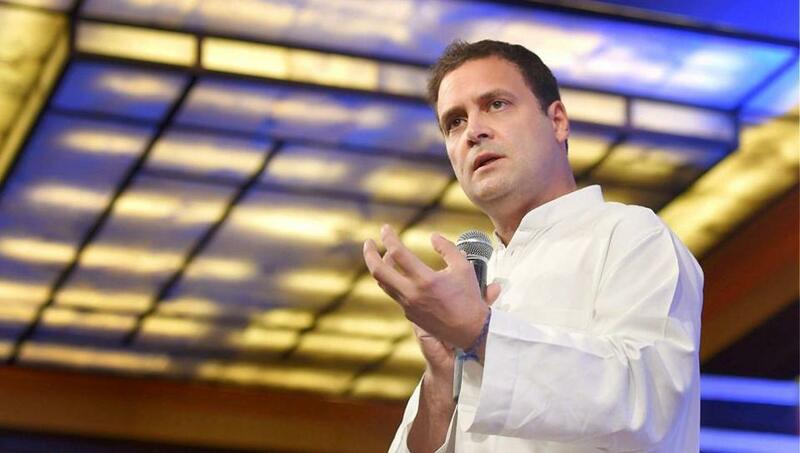 March 30, 12:25 PM: Criticizing the ruling party for failing developments through its schemes, Congress President Rahul Gandhi on Friday announced that he will scrap Niti Aayog if his party comes into power in 2019 Lok Sabha elections. The scheme will be replaced with a “lean” Planning Commission. March 30, 11:48 PM: Prime Minister Narendra Modi addressing a rally in Aalo, Arunachal Pradesh. Arunachal Pradesh will vote in a single phase on April 11 for its 2 Lok Sabha Seats and 60 State Assembly seats. General Elections are slated to be clubbed with State Polls of Arunachal. March 30, 11:40 AM: Bharatiya Janata Party (BJP) President Amit Shah holds a roadshow in Ahmedabad ahead of filing nominations from Gandhinagar Lok Sabha Seat. He has replaced LK Advani from Gandhi Nagar. Union Ministers Rajnath Singh, Nitin Gadkari, Piyush Goyal, Ram Vilas Paswan, Shiv Sena chief Uddhav Thackeray, Shiromani Akali Dal leader Parkash Singh Badal & others present with him. March 30, 11:33 AM: Bharatiya Janta Party is predicted to gain grounds in West Bengal. According to the Opinion Poll by Pollster Nielsen and News Channel, the saffron party will win 8 parliamentary seats in the next month’s national elections 2019 against its 2 in the previous elections held in 2014. March 30, 11:10 AM: Samajwadi Party (SP) releases a list of two candidates for Lok Sabha Polls 2019. Party named Ram Kumar from Kanpur Seat, and Rambhual Nishad to contest from Gorakhpur Lok Sabha Seat. The party has so far declared a total of 26 candidates out of 37 seats allotted to it in alliance with BSP. March 30, 11:04 AM: Union Ministers Rajnath Singh, Nitin Gadkari, Piyush Goyal, Ram Vilas Paswan, Shiv Sena chief Uddhav Thackeray, Shiromani Akali Dal leader Parkash Singh Badal & others at ‘Vijay Sankalp Sabha’, ahead of Amit Shah’s filing of nomination from Gandhinagar LS constituency. March 30, 9:22 AM: Election Commission on Saturday sends second notice to Ministries of Railways and aviation over the matter of PM Narendra Modi’s pictures printed on railway tickets and boarding passes. Both Ministries has been asked to file a reply by today. March 30, 9:10 AM: Nishad Party in Uttar Pradesh days after joining hands with Gathbandhan has now decided to go its own. Announcing the disassociation from Grand Alliance, Sanjay Nishad said, Akhilesh Yadav had said he’ll make the announcement on seats for our party. But they didn’t put our name on poster/letter or anything. My party workers, authorities, core committee were upset. He added, So the Nishad party has taken a decision today that we are not with the ‘gathbandhan’, we are free, can fight elections independently & can look for other options as well. The party is free now. Later he met Uttar Pradesh Chief Minister Yogi Adityanath. March 30, 8:40 AM: Bharatiya Janta Party President Amit Shah is all set to file nominations from Gandhinagar Seat of Gujarat. Preparations are underway ahead of the filing. Shiv Sena Chief Uddhav Thackeray to accompany him on his nomination filing. March 29, 3:35 PM: Congress MP from Karnataka’s Tumkur Muddahanumegowda withdrawn his nomination from the Lok Sabha Seat after hours of Deliberations and the mediation by Deputy CM G Parameshwara. Muddahanumegowda throws his hat as an Independent candidate after JD(S) Chief HD Deve Gowda has been announced as Congress-JD(S) candidate from Tumkur. March 29, 2:15 PM: Congress releases a list of 5 candidates (4 Assam & 1 Uttar Pradesh) for the upcoming. BJP Sitting MP Ashok Dohare who joined the party earlier today, to contest from Etawah parliamentary constituency. 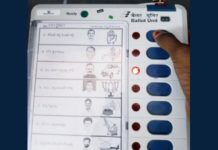 March 29, 2:00 PM: Election Commission on Friday in Top Court opposed a plea filed by 21 opposition parties seeking direction to verify 50 percent EVM-VVPAT Vote Count before the declaration of results in upcoming General Elections. The Poll body in its affidavit said there’s no need to increase VVPAT count to match it with EVM. Petition filed by Opposition Leaders Including AAP Chief Arvind Kejriwal, TDP Boss Chandrababu Naidu, NCP Chief Sharad Pawar and Samajwadi Party Leader Akhilesh Yadav stated that the High Court Should direct the poll panel for verification of at least 50% of Electronic Voting Machines (EVMs) using the voter-verifiable paper audit trail (VVPAT) in every assembly segment or assembly constituency. March 29, 1:28 PM: Bharatiya Janata Party has on Friday released the 12th list of 11 candidates in Jammu & Kashmir, Karnataka, Madhya Pradesh, Maharashtra & Rajasthan for Lok Sabha Elections 2019. The Saffron party in the latest list named Balak Nath from Alwar Seat of Rajasthan, among others. The party has so far declared its candidates on over 350 Candidates. March 29, 11:56 AM: Bihar Mahagathbandhan on Friday released seat-sharing agreement for 40 Lok Sabha seats. RJD to contest on 19 seats, Congress on 9 seats, RLSP on 5 seats, HAM(S) on 3 seats, VIP on 3 seats and CPI(ML) on 1 seat. RJD Leader Tejashwi Yadav, RJD announced Sharad Yadav to contest from Madhepura, Sarfraz Alam from Araria and Misa Bharti from Pataliputra in the mega battle of ballots. Speaking about the Mahagathbandhan in Bihar, Yadav said RJD to contest on 19 seats including Bhagalpur, Banka, Madhyapura, and Darbhanga. RLSP to contest on 5 seats, Congress to contest on 9 seats including Patna Saheb. Bihar Mahagathbandhan released seat-sharing agreement for 40 Lok Sabha seats. RJD to contest on 19 seats, Congress on 9 seats, RLSP on 5 seats, HAM(S) on 3 seats, VIP on 3 seats and CPI(ML) on 1 seat. March 29, 11:40 PM: In a setback to BJP in Uttar Pradesh, its Sitting MP from UP’s Etawah, Ashok Kumar Dohre joins Congress in presence of Congress President Rahul Gandhi. Earlier on Wednesday, BJP outgoing MP from Hardoi Anshul Verma shifted loyalties to Samajwadi Party after being dropped his name was dropped by the party for the next month Lok Sabha Polls.